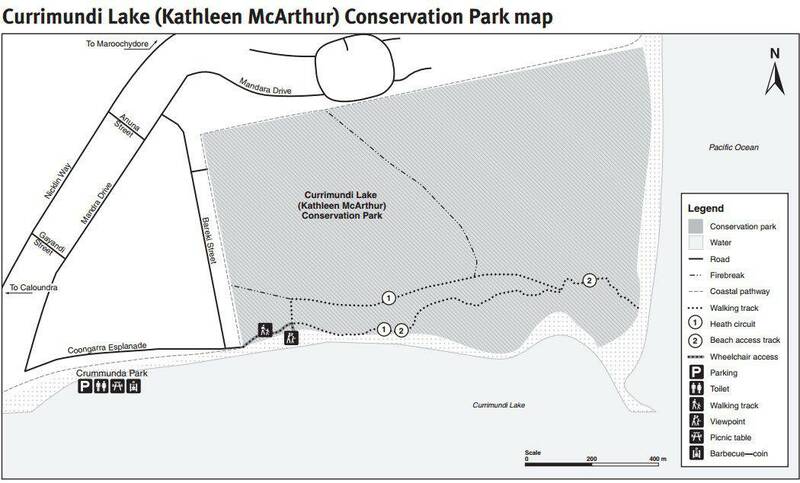 Currimundi Lake Conservation Park (also known as Kathleen McArthur Conservation Park) was named after Kathleen McArthur who was a conservationist and wildflower artist. Kathleen had campaigned for the protection of this lake and other wallum heathlands on the Sunshine Coast. This conservation park is an interesting place to take a walk and photographs a wide array of bird species who live within the park. The main entrance to the park is found at the end of Coongarra Esplanade which is on the northern shore of the Currimundi Lake, approximately 4 kilometres north of Caloundra. Visitors come to Currimundi Lake to kayak, watch birds, take long bushwalks and study nature. At the entry of the conservation park, you will spot a kayak launching platform. Heath Circuit: 1.4km (return), allow 40 mins, you will be taken through woodland and to a viewing point that looks over Currimundi Lake. Look out for a huge range of natural wildflowers and plants. Beach Access Track: 2km (return), allow 1 hour, you will follow Heath Circuit before branching off into the forest where you will have scenic views south to Caloundra and south-east to Moreton Island. Picnic facilities are not provided in the park, however, you can find picnic tables, BBQ’s and toilets in the nearby Crummunda Park.